Histories: Journalism education in Australia. It is now more than 90 years since the first Australian university-based Journalism program was established. In that time, Australian universities have played an increasingly important role in the training and education of generations of Australian journalists. Despite this, there exists an often tense – sometimes even acrimonious – relationship between university-based journalism programs on the one hand and Australia’s major media companies who are the employers of choice for many journalism graduates on the other (Bacon 2004; McLean 2004). Today, 29 universities offer journalism programs, both undergraduate and postgraduate, throughout Australia. There are also a number of non-university providers that offer mainly diploma level courses. These programs are not included in this project. The extent of university-based offering varies considerably, with a number providing a small suite of journalism subjects as part of an Arts, Humanities or Communications degree, ranging up to others that offer a dedicated Bachelor of Journalism degree. Historically, much of the tension between universities and industry has been due to the fact that Journalism has been considered a craft in which skills are acquired on-the-job, often by osmosis, with younger journalists picking up skills by observing their older colleagues in action, and/or by attending a small number of in-house courses. However, over time, as technology has played a greater role in the acquisition of information, and its subsequent conversion into a journalistic format, media organisations have acknowledged that they no longer have the capacity to provide all the training journalists require to operate in an increasingly technology-driven world. Because of this, they have gradually embraced the notion of university-based training for prospective journalists. However, in doing this, a number of employers have been reluctant to mandate that a degree in Journalism is a prerequisite for a career in Journalism. Furthermore, there has been – and continues to be – considerable debate over what constitutes a useful degree in Journalism, with some commentators preferring a generalist degree, while others preferred a skills-based degree. are university-based journalism programs equipped to provide those skills, particularly in a rapidly changing environment? Underpinning this debate is another question: (3) how can programs that offer only a smattering of Journalism subjects realistically claim to compete with programs that offer comprehensive degrees? In part this debate is linked to the broader question: is journalism a profession, a craft or a trade? This is a surprisingly complex question, the answer often depending on the background and sympathies of the individual asked for their opinion. For much of its history, Journalism has been considered a craft or trade, attracting people straight out of school, rather than those with university educations. Training was conducted in-house, with would-be journalists starting at the bottom as copy boys or girls before commencing a three or four-year cadetship. Under the auspices of senior colleagues, they would be taught the skills required to produce news and feature stories. Their training included interview skills, note-taking (with shorthand often a compulsory requirement), how to structure stories using the inverted pyramid and 5Ws and H (asking the fundamental questions who, what, why, where, when and how) approaches, spelling, grammar and layout. They would also receive training in ethics and media law. This training would take place on-the-job. That is, the cadets would not only be learning the skills of journalism, they would also be producing copy as journalists, initially simple stories, gradually progressing to more complex assignments as they moved through the cadet ranks and showed they were capable of tackling more difficult assignments. Having successfully completed their cadetship, they would become graded journalists. It was an era in which journalists and journalistic hopefuls were expected to sink or swim – those who succeeded were guaranteed careers, while those who floundered would be cast adrift. The early history of Australian journalism education and training was captured in a PhD thesis entitled Our judges’ credentials: development of journalism education and training in Australia to 1987 researched by Charles Stuart through the University of Wollongong and awarded in 1996. While Stuart’s research does not cover the tumultuous years of the late 20th and early 21st centuries when the way journalism was conducted and content delivered was subjected to sweeping reforms as a result of technological change, it nonetheless provides considerable information regarding the development of training in the early years. The following is a detailed summary of the early history as documented by Stuart. Aware of the historic tensions between industry and Journalism educators, Stuart distinguishes between Journalism education, which he defines as ‘programs offered by tertiary education institutions designed to impart an expanded knowledge of the world that will help the recipients in the practice of journalism’ and training which is ‘instruction in the gathering, processing and presentation of news’. This distinction is critical because it contains the seeds of much of the debate that has marred the relationship between industry and the academy over the years, not just recently. According to Stuart (1996, p. 2) Australian journalism education and training has moved through four periods. These were 1803-1910, 1911 to 1969, 1969-1987 and 1987 to the present. During the first, training was virtually non-existent. The second phase followed the establishment of the journalists’ union, the Australian Journalists’ Association (AJA), in 1910 and was marked by the introduction of journalism courses at a number of universities, beginning in 1919. This period also witnessed the development of the cadetship system, the main driver of which was the AJA. The third phase saw the development of Colleges of Advanced Education (CAEs) which saw the offering of courses combining journalism education and training as part of their remit. According to Stuart, this period saw the decline of the cadetship system. The final stage – albeit only loosely covered by Stuart – includes the period in which CAEs gained university status. It is this period that provides the impetus for the current debate, although to understand the development of journalism education, it is important to go back further and look at the early years. In outlining the development of journalism education and training in Australia, Stuart also provides an overview of developments in four other countries – Germany, the US, Britain and New Zealand. Drawing on earlier research by Gaunt (1992) and Katzen (1975), Stuart contends that the first lectures on journalism were delivered in Germany. Leipzig University appeared to be the first (1672), followed by Halle (1700) and Gottingen (1175-1805) (Stuart, 1996 vol 2, p. 16). In 1690 Leipzig University presented the first doctoral thesis on Journalism, Tobias Peucer’s De relationibus novellis (translated as On news reporting) (See Lloyd, 2002, p. 2). However, according to Gaunt (cited in Stuart, 1996, vol. 2, p. 16), the role of German universities in providing journalism education at that time was short-lived. Formal journalism education disappeared when Germany introduced a binary education system in which universities focussed on ‘conveying intellectual knowledge’ and colleges provided vocational training. However, according to Gaunt, journalism education was not catered for in the new environment, being provided by neither universities nor colleges (Gaunt, 1992, p. 49; Stuart, 1996, vol. 2, p. 16). Journalism education is not reintroduced in Germany until the early 20th century – 1916 according to Katzen, when the Institute of Newspaper Science is established at Leipzig University (1975, p. 72), possibly a little earlier according to Stuart (1996 (2), p. 17). Stuart provides considerable insight into the development of journalism education in Germany, including the tendency of students to move between universities in undertaking their studies, and the establishment of American-style Journalism schools by the occupying forces post WWII (Gaunt, 1992, p. 50; Stuart, 1996(2), p. 18). University-based journalism education in the US can be traced to the late 18th/early 19th centuries. The University of Missouri traces its first lectures back to 1878 and Cornell University to 1876-77 (Stuart, 1996(2), p. 19). The first course in Journalism is believed to have commenced at the University of Pennsylvania in 1894 (Curthoys (1922a, p. 216), followed by the first four year degree at the University of Illinois (Mott, 1962, p. 604; Stuart, 1996(2), p. 19). By 1912, there were more than 30 university or college-based journalism programs operating in the US, a number that grew rapidly to 672 by the mid 1950s and 1148 in 1969 (Katzen, 1975, p. 21; Stuart, Vol. 2, p. 19). One of the interesting features about the development of university-based Journalism education in the US was that from the outset it appeared to have the support of media proprietors. For example, the Journalism school at Columbia University was established with a substantial grant from the executors of Joseph Pulitzer’s estate, with the owners of the Chicago Tribune funding the Medill School of Journalism at North-Western University (Stuart, 1996(2), p. 19). Even today, the support of proprietors for US-based journalism education is reflected in the funding of endowed chairs in Journalism at many of the top schools. While Stuart reports that the early response to the establishment of journalism schools by working journalists was negative, a view also held by many newspaper editors in the 1930s and 1940s, support had risen among newspaper executives by the 1950s and by the 1960s editors were visiting J Schools to hand-pick the best graduates. This policy appeared to pay dividends, because by 1980 three out of four editorial executives had Journalism degrees (Stuart, 1996(2). p. 20). In fact, according to Stuart, the success of the university-based Journalism programs ‘stifled’ the emergence of a ‘standardised on-the-job journalism training system in America’ along the lines of those established elsewhere, including Australia (Stuart, vol. 2, Appendix C, pp. 20). The first attempts to introduce university-based Journalism education in the UK appear to have taken place early in the 20th century. According to Stuart, there were a number of ‘short-lived’ attempts between 1908 and 1919 (Stuart, vol. 2, p. 22, citing Carr and Stevens, 1946, p. 9). The first course, a two-year diploma, commenced at the University of London in October 1919 (Stuart, p. 22, 25). According to Stuart, the program was supported via scholarships by the British Government which was seeking training opportunities for ex-servicemen (pg 22). This program was also supported by media proprietors and the National Union of Journalists (NUJ) (Stuart, p 22). The British program bore strong similarities to that which was recommended for introduction in Australia about the same time by the AJA’s Western Australian District Committee (p. 22), with a mix of on-the-job training and university education. The course ran until the start of WWII in 1939 when it was suspended, never to resume (p. 22). Following the first report of the Royal Commission into the Press in 1949, which stated that journalism training was ‘the common responsibility of proprietors, editors and other journalists’, a training body – the National Council for the Training of Journalists (NCTJ) was established with a common syllabus providing on-the-job training, supplemented by a series of courses provided by polytechnics and technical colleges (Stuart, p. 23). By 1987 there were seven accredited colleges throughout the UK (p. 23). Successful candidates received a Proficiency Certificate that was issued by the NCTJ and recognised nationally (p. 23). Trainees were also required to serve an indenture period ranging from 18 months to two years, depending on the training they acquired prior to starting in journalism. As in the US, early attempts to establish journalism programs were aided by the generosity of proprietors. In 1962, UK newspaper proprietor Roy Thomson established a £5 million foundation to promote journalism education in Cardiff, home to his newspaper chain (Stuart, p. 24). Initially established to establish newspapers and train journalists in developing countries, the Thomson Foundation in 1970 merged with the Journalism program at Cardiff University which then established a range of degree programs. A graduate program was established at City University London in 1976 which also appointed the first chair in Journalism in 1983. University-based journalism education appears to have commenced at the University of New Zealand’s Canterbury College around 1910 (see vol. 1, p. 17). The qualification – a diploma of Journalism – did not contain any practical journalism training. However, there is some evidence of practical journalism being taught by 1921 (Stuart, vol. 2, p. 28). The course appeared to survive until the mid 1930s (p.18). In New Zealand, there was a second wave of journalism education that began in 1966 when the Wellington Polytechnic offered a one year course. According to Patching (1983), this course was intended to replace formal cadetships. It was quickly followed by a one year post-graduate diploma in journalism at Canterbury University in 1969, an 18 week induction program at Wellington Polytechnic in 1972, and courses at the Waiariki Community College (1985), Manukau Polytechnic (1986) and Christchurch Polytechnic (1987) (Tully, 1990, cited in Stuart 1996, p. 18). Today, Journalism training in New Zealand is managed through the Journalism Training Organisation (JTO). This is a formal body funded through industry subscriptions. First established in 1971 as the NZ Journalists Training Committee (NZJTC), subsequently renamed Journalists’ Training Board (JTB) in 1973, since 1993 it has operated as the NZ Journalists’ Training Organisation (Thomas, 2000). The JTO is managed by a committee which has responsibility for setting and maintaining Journalism training standards in NZ (Thomas 2000). The JTO has set a series of performance based skills ‘ that have formed the basis for … journalism unit standards and are at the heart or core of all journalism training in New Zealand’ (Thomas, 2000). According to Stuart (1996, p. iii) the early driver behind journalism education and training was the journalists’ union, the Australian Journalists’ Association (AJA). This was in contrast to the minor roles played by unions in the UK and New Zealand (p. 18). According to Stuart (p. 19), the significant role played by the AJA is reflected in the pages of its newspaper, The Australian Journalist. First published in 1912, the newspaper devotes considerable space to discussions about – and support for – the US model of journalism education (Stuart, p. 25-28). However Stuart questions whether this is because it is the only material available, a view reinforced by the lack of coverage the US model receives after knowledge of the NZ courses crosses the Tasman in 1916 (p. 28). To the real journalist – the born journalist – a University course must have the same broadening cultural effect that it has on any other brainy professional man (Carmichael, 1914, p. 1; cited by Stuart, 1996, p. 37)). Grammar and style can be taught. General knowledge, of which no pressman can have enough, can be taught, and the mechanics, the responsibilities and morals of presswork can be taught. I can see no reason, therefore, why the universities should not be able to frame a scheme for a diploma in Journalism (Nicholls, 1916, p. 184). the lack of an incentive to continue studying once their cadetships have been completed and they have been graded as journalists. The reality that graduation from the courses is not tied to promotion within the profession (1965, p. 38; Stuart, 1996, p. 45). The courses were an awkward attempt to bridge the gap between journalistic practice and academic; they carried little status academically, and yet in the eyes of the profession they were sufficiently removed from the reality of journalistic practice to be virtually ignored (Wallace, 1977, p. 8; Stuart, p. 45). Writing in 1963, Hudson argued not only that the part-time university courses have failed, but so too had the cadet system. His solution: to introduce pre-entry university courses modelled on those that had been introduced in the US. However, Hudson was not the only critic of journalism education and training. His thesis identified a number of others, an approach Stuart was able to build on. For example, Stuart identified two critics of early Australian university courses as Roderick and Revill, two journalists who had co-authored one of the first textbooks for cadets: The Journalist’s Craft – A Guide to Modern Practice. While acknowledging that a university degree is useful, they indicated that it wasn’t a necessary qualification for someone to succeed in Journalism. Roderick and Revill appeared to be more supportive of generalist degrees than the first university-based journalism programs. If journalism is to achieve true professional standing, it must enlist the services of the university. If the university wishes to have a well-informed and truly critical press — as I believe it does — it must hold out a hand to the journalists (Roderick, 1968, pp 15-26; cited in Stuart, 1996, 49. … take early opportunity to make their own courses conform to a true university standard and make arrangements for such groups of students as are below the necessary academic level to be taught elsewhere (Murray, 1957, p. 34). Seeking to protect the elitist nature of the universities – a call apparently championed by Prime Minister Menzies – the federal government set up the Committee on the Future of Education in Australia (Stuart, p. 51). The committee, chaired by Sir Leslie Martin, was tasked to ‘find a cheap way of training more professionals and technologists’ (Stuart, p. 51). The solution was the establishment of Colleges of Advanced Education (CAEs). These would be funded by the government to provide diploma level courses. We in journalism hold that we teach our own technology fairly well. We believe that in the technology of journalism we do not have to seek the guidance from lecturers at institutes, but we do believe there is a great need for us to join the mainstream of higher education flowing out of our universities (Mitchell, 1968, p. 63; Stuart, 54). The only practical training for cadet journalists is on-the-job training in newspaper offices. No newspaper, and I doubt any radio station or television station, would consider supporting any proposition for off-the-job training in a technical college or institute of technology (Mitchell, 1968, pp 77-78; Stuart, p. 54). We are in the midst of an academic explosion and we have to meet it. Not only do we have to have a good general education standard to enter the profession, but there is a need to continue to improve that standard. In short, there must be a scheme which provides for cadets to continue their education (Whitelock, 1972, p. 22). Crossland was writing at a time when the AJA had already extracted considerable concessions from employers regarding cadet training. In 1970, for example, metropolitan proprietors had agreed to increase the amount of time cadets could have off for study from four hours per week to 10. The significant element of this agreement was that six of these hours were to enable the cadet to attend university or CAE ‘for … the Diploma of Journalism or other approved course’. This is discussed further in chapter 2. … considerable diversity among the various programs. This is not to say there should be a standard curriculum for journalism education, but I do think that in any field of professional training the similarities among degree granting courses of instruction ought to be greater than the differences. My impression – and I must emphasize the word – is that in Australia it is perhaps the other way round (Duncan, 1977, p. 2). Whether this was the case or not, is difficult to tell, without having a look at the individual structures of all programs on offer during the mid 1970s. Ten years on, however, it appears that the courses were much closer in terms of content (Fell, 1987, p. 17). Significantly, Duncan commented on the ‘apparent indifference’ of journalists towards the courses (Duncan, 1977, p. 3), with employers indicating a greater preference for the practical journalism units over either the theoretical units or even liberal arts studies (Woolford, 1979, p. 49). In part the stimulus for journalism training in Australia came from amendments to the Commonwealth Arbitration Act in 1910 which, according to Sparrow, ‘made it possible to classify journalism as an industry’ (Stuart, p. 31; Sparrow, 1960, p. 27-36). The Australian Journalists’ Association (AJA) as it was then called, was registered under the Commonwealth Conciliation and Arbitration Act on May 24, 1911 (Sparrow, p. 41; Stuart, p. 33). According to Stuart (p. 34) registration led to the establishment of on-the-job training for journalists via the so-called cadetship system. This was a significant advancement on the earlier system, in which ‘Parents even paid premiums to newspapers to have their sons taught journalism’ (Sparrow, 1960, p. 44). Such apprentices were often indentured to their employers (or masters) for periods of five years. Under the agreement they would ‘work 10 hour days, seven days a week, in return for training, board and lodging, and pocket money.’ The Vet, 1928, p. 122; cited in Stuart, p. 32). According to Bathurst, (1914(a), p. 25) reporters were often not considered to be journalists – this title being reserved for editors, leader-writers and contributors (Stuart, p. 32). … reporters who at the time of their first engagement on the staff of a newspaper have not had more than six months experience in the metropolis, or more than 12 months experience in the country as reporters (VDC, 1911, p. 46). Any chief of staff who is worth his salt can tell in a few weeks whether a man is going to develop into a journalist or not. Let him have three months. Alter the definition of a cadet to mean a man who is on trial for three months with the provision that at the end of that period he shall be either dismissed or taken on the graded staff (A.B.C, 1913, p. 18; Stuart, p. 70). The first mandated agreements saw three grades of reporters (senior, general and junior), of which only the senior reporter was considered ‘fully qualified’. The general and junior reporters were considered trainees, while the cadets were not (Stuart, p. 71). The status of cadets – and the responsibility of employers for their training – was clarified in negotiations which led to the 1917 agreement by Mr Justice Isaacs (Stuart, p. 71). By 1918, the AJA was pushing for formal qualifications for people applying for cadetships (Stuart, p. 73). By 1920, there was some support within the AJA for the proposition that cadetships no longer be considered periods of probation, but rather formal traineeships (Stuart, p. 73). In 1927, the AJA’s federal council passed a motion supporting the introduction of formal cadet training (p. 74) . At a conference chaired by R.G. Menzies KC, later to become Australian Prime Minister, it was agreed that prospective cadets should have ‘at least the equivalent of intermediate university knowledge of English’ (Stuart p. 75). Employers should pay for the costs of courses and associated texts (Stuart, p. 76). Menzies did not accept that cadets should be articled or indentured (Stuart, p. 76). Further, he rejected the suggestion that a Board of Control be set up in each state to ensure that the articles of apprenticeship were honoured. In doing so, Menzies effectively provided employers with the capacity to ignore the teaching obligation highlighted above. In fact, most employers were able to skirt around this clause for almost 30 years. Under the 1938 award, other elements of the Menzies agreement are watered down, including the requirement that cadets were required to have prior qualifications (in this case English competence). Prior qualifications were reintroduced in 1984. The 1938 award also removed any reference to the need to develop a syllabus of specified areas of knowledge. In earlier awards these had included ‘literature, economics, civics, history and logic’ (106 CAR, 1210; Stuart, p. 77)). These were not reintroduced, in part at least, until 1963 (Stuart, 77). (82 CAR 313; Stuart, 79). According to Stuart, the 1958 award remained virtually unchanged, although by 1961 the focus on shorthand had increased dramatically, with employers being empowered to sanction cadets who did not achieve the required proficiency in shorthand. The 1961 award also sought to specify which subjects cadets should receive instruction on (Stuart, 79). The 1963 award went one step further, requiring employers to provide cadets who had completed their training with a certificate detailing the training received (p. 79). 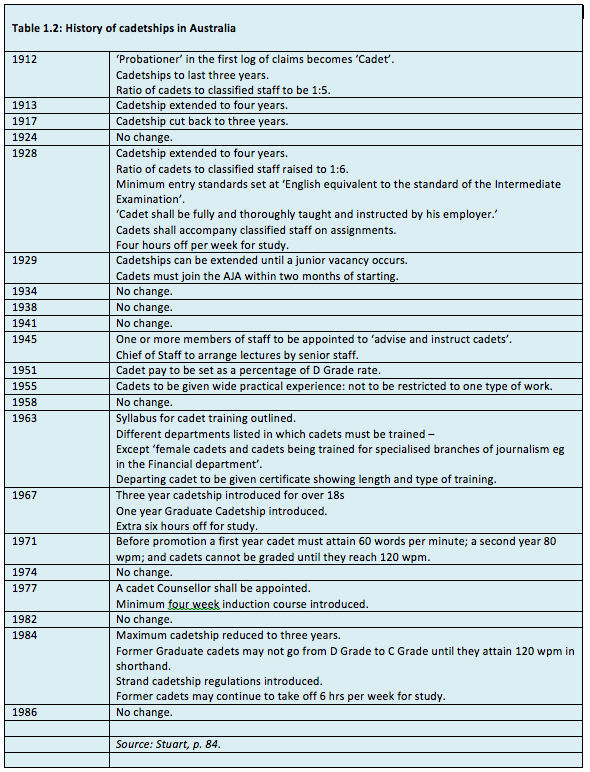 In 1967 a number of additional categories of cadetship were introduced. Alongside the traditional four-year cadetship, employers had proposed the establishment of a three year cadetship for people aged over 18. While this was ‘strongly opposed’ by the AJA, it did recommend the introduction of a new form of cadetship which advocated a minimum level of appointment for graduate cadets. This was accepted by employers and the new award provided that this should be no longer than one year for metropolitan cadets (127 CAR 816; Stuart, p. 80). Later awards would seek to distinguish between metropolitan and regional cadets in relation to this provision. Under the 1971 award, three further changes were introduced. The in-house supervisor of cadet training received the title ‘cadet counsellor’; the shorthand requirements were further tightened, and cadets received additional time off for study. Whereas previous awards had mandated that they receive four hours instruction a week in typing and shorthand, under the 1971 award, they were to receive an additional six hours per week to ‘undertake journalism courses at universities or CAEs (Stuart, 81; 139 CAR 429). It should be pointed out, however, that in the early years, there was little agreement between the metropolitan proprietors and their regional or provincial counterparts. While the metropolitan awards were federally based, those covering the provincial papers were generally state-based (see Stuart, p. 86). Whereas the early metropolitan awards devoted space to cadetships, the provincial agreements generally did not (p. 86). It was not until 1924 that a commonwealth award was drafted to cover provincial newspapers in all states. In 1912, for example, there were 18 agreements (Stuart, p. 87; 6 CAR pp 181-212). In 1964, there were 10 generic awards, with an additional five publication specific awards (see footnote 56, Stuart, p. 87; 107 CAR, p. 1220). By 1987, there were just 12 generic awards, and a number covering the ABC. A detailed analysis of Stuart’s thesis reveals that the cadetship training program was widely considered a failure, by cadets, experienced journalists and outside observers. It appears that the development of CAE-based journalism courses provided employers with an opportunity to rid themselves of in-house training obligations, despite the fact that these functions were still mandated within various awards (See Britton, 1987, p. 1). In fact Stuart argues that by 1987, the cadetship system is ‘largely a shibboleth’. The major faults with the cadetship system were widely considered to be threefold: (1) the pressure between work and study means that young journalists often do not have time to attend class or undertake assessment tasks; (2) it is possible to be graded without completely a program of study; and (3) cadets are often exploited as cheap labour and they are ‘reluctant to rock the boat’ and demand their entitlements under the award (Stuart, p. 99). that there was ‘no special standard of education’ required for people to enter journalism. That the population and media market in Australia was too small to warrant the establishment of a chair of journalism (although he did say this could change if the appointee was able to divide their time between Melbourne and Sydney). Further, that people appointed to run the university-based diploma courses should be both graduates and have completed their journalism training. The degree (or diploma) should comprise 10 units (English language and literature, philosophy, constitutional history, political economy, science of politics, three practical journalism subjects and an optional subject. Matriculation should be waived as a prerequisite for entry into the degree or diploma program. Journalists should be asked how many would be prepared to enrol in such a course. The AJA should set up a library containing the textbooks required for such a course in each state. The establishment of an exchange program with journalists operating elsewhere within the Empire. What is the use of asking “Is not the reporter of 20 years’ experience a better pressman than a cub straight from the classroom?’ No doubt he is; but that is not the point. What we should ask is this: “Is not the man of 20 years’ experience likely to be an even better journalist if he has a good education to begin with?” I think any reasoning and unprejudiced person will say “yes” (Stuart, 1996, vol. ii, pp118-19. (Source: Stuart, vol. ii, pp 119). However, even in 1916 there was some doubt as to whether journalism can, or should, be taught within a university environment. For example, Stuart cites H.G. Adam, who described the newspaper office as ‘the only school of journalism’. However, even Adam supported the idea of a diploma being awarded, which echoed Dixon’s call for proof of evidence as a journalist and the writing of a thesis. Adam went further to add ‘cuttings from newspapers of certain standing, showing work actually done along general and special lines; and the recommendation of at least two holders of the diploma’. Interestingly, Adam recommended that the body of work be submitted to the British Institute of Journalists (BIJ)for sign-off (Stuart, p. 103). While the Central Committee embraced the broad tenets of the Whyte and Dixon reports, it ultimately moved in favour of the latter, suggesting that young journalists did not require the technical skills proposed by Whyte, preferring instead that they receive a ‘general education and the culture and breadth of outlook which comes with it’ (AJA, 1919, p. 31-3; Stuart, 104). Ability to pass examinations is one thing – journalistic ability is quite another thing; and some of the ablest journalist I have known have been men who did not distinguish themselves at school, and could not have passed even an entrance examination to a university. Put what obstacles you will in the way of entrance to a journalistic career, but let them be such obstacles as are to be overcome by the kind of ability a journalist needs, not by some other irrelevant kind of ability (AJA, 1918m, p. 483; Stuart, 105). As to the proposed Diploma in Journalism, I have grave doubts, both as a university teacher and as an observer of journalists since babyhood on a journalist’s knee. In the former capacity, I am no believer in the granting of diplomas in things a university does not, and perhaps cannot, teach (Shann, 1920, p. 210). Significantly, however, Shann did give the lectures on History and Economics to participants in the West Australian program. While the proposal appeared to gain support in WA, Qld, Victoria and NSW, there was less support in Tasmania. While the university and the AJA were keen, there were a number of stumbling blocks, including an apparent resistance from potential candidates and the money required to employ an English lecturer. It was not until the 1990s that Tasmania introduced its first university-based journalism program. South Australia was similarly slow to introduce a university-based program. While the state branch of the AJA set up a committee in 1918 to investigate the possibility of a degree program, it was not until 1958 that Adelaide University introduced a course on journalism law. The one-off course consisted of 10 two-hour sessions and was run by the Department of Adult Education (AJA, 1958a, p. 3; Stuart, p. 109). The first diploma course was not introduced until 1974 and was offered at Murray Park CAE, a forerunner to the University of South Australia. 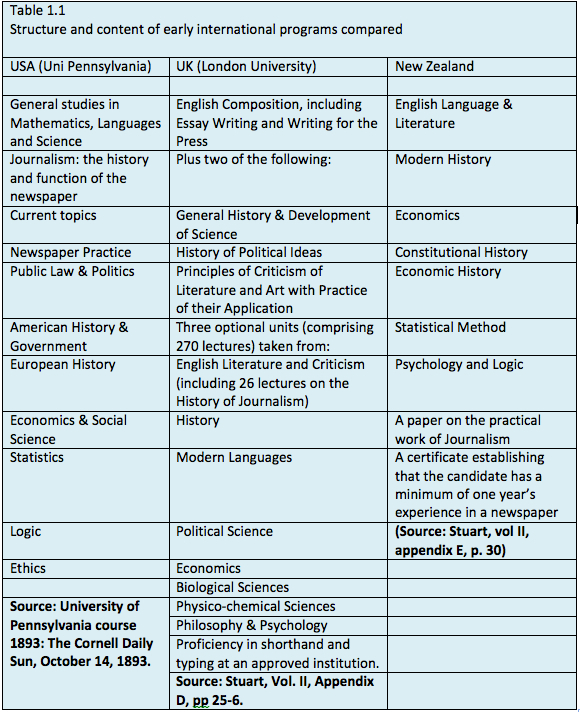 Much of the debate in the early years involved the content of the courses, primarily whether the universities should be offering Journalism units. Significantly, the universities found that enrolments increased when practical journalism units were offered alongside the traditional Arts—based units. However, enrolments were still low, as journalists struggled to balance their work obligations with study commitments. Invariably, there was a sizeable drop off in enrolments as the year progressed. The first journalism courses were introduced by the University of Western Australia in 1928, followed by Sydney, Queensland and Melbourne universities. Significantly, these courses were taught by practising journalists (Stuart, p. 253), and were considered to be journalism training as opposed to education. The fact that they were taught within a university environment, however, led Stuart to suggest that they provided a ‘nexus between journalism education and training’ (Stuart, p. 253). The significance of these courses was highlighted in 1948 when all Brisbane-based cadets were required to enrol in the UQ program. Melbourne-based cadets were also encouraged to enrol in the Melbourne University program – the latter, according to Stuart, as a substitute for some of the in-house courses that were required under the award (p. 253), However, it is accepted that these first four courses – offered at diploma level – were ‘unredeemed failures’ (Mayer, 1965; Stuart, p. 254). Despite the apparent success of the US-based courses, the Australian programs tended to be based on the UK’s Oxbridge model. However, this did not mean that there was a uniformity of content. Those that were run by journalists tended to be more practical in focus, while those established under academics were more theoretical. In fact Stuart warned (p. 255) that unless steps were taken to develop a uniform curriculum (his term was ‘homogenise’ the offerings), they would continue to develop in different directions. Today, Journalism is offered at 32 universities, with another program due to commence at the Australian Catholic University in Brisbane. This does not include offerings available through Open Universities Australia (OUA) or private providers such as the JSchool in Brisbane and Macleay College in Sydney. Of the university-based programs, fewer than half offer a discrete Bachelor of Journalism, the majority preferring to offer a smaller suite of subjects that are variously badged under a Bachelor of Arts, Bachelor of Media or Bachelor of Communication/s.